Dr. Moselio Schaechter is a Distinguished Professor Emeritus at Tufts University School of Medicine, Adjunct Professor at San Diego State University, and an Adjuct Professor at the University of California, San Diego. In addition, he is author of the American Society for Microbiology Small Things Considered blog and co-host of the This Week in Microbiology podcast with Vincent Racaniello. Elio received his M.S. in Bacteriology from the University of Kansas and his Ph.D. in Microbiology from the University of Pennsylvania. He was drafted into the Army with the U.S. Army Walter Reed Army Institute of Research and conducted postdoctoral research at the State Serum Institute in Copenhagen. Elio served briefly on the faculty of the University of Florida Medical School and subsequently joined the faculty at Tufts University where he remained for 33 years. He was named a fellow of the American Academy of Microbiology, a Tufts University Distinguished Professor, an Honorary member of the American society for microbiology, Honorary Member of the Ecuadorian Society for Microbiology, and an Honorary Member of the Spanish Society for Microbiology. He is the recipient of the Tufts University Medical Students’ Teaching Award 11 times, is the Past President of the American Society for Microbiology, and has received many other honors. Elio is here with us today to tell us all about his journey through life and science. Elio is passionate about studying, hunting for, and eating wild mushrooms. Porcini mushrooms are his favorite, but he likes them all. After a fulfilling career as a faculty member running his own microbiology research laboratory, Elio has retired from conducting science at the bench but continues to be an active member of the scientific community. Currently, he is keeping busy communicating science through the American Society for Microbiology Small Things Considered blog, the This Week in Microbiology podcast, as well as giving various presentations and lectures. Elio was born in Italy, and his family moved to Ecuador during WWII. After reading the book Microbe Hunters by Paul de Kruif, Elio became fascinated with microbiology and looked up to microbiologists as heroes. He was able to get some hands-on experience doing science while working in a pharmaceutical company’s research department during high school, and his interest in science and research continued to flourish. Growing up in Ecuador, Elio gained practical experience but had a very poor background in quantitative sciences like physics and chemistry. When he came to the U.S. for graduate school, he had a difficult time. Elio shied away from a lot of interesting research questions because he felt like he didn’t have the foundation necessary to pursue highly quantitative research. Elio and his colleagues made an astonishing discovery about how the chromosomes in bacteria interact with the bacterial cell membrane during cell division/replication. Essentially, the point in the chromosome where replication begins binds to the cell membrane when (and only when) the DNA is newly made. This was a surprising result, and it was really exciting to answer one of these big mechanistic questions in the field. Copenhagen holds a special place in Elio’s memory, and he recalls spending the happiest years of his life there. The people he met and worked with were wonderful, generous, thoughtful, and accepting. He remembers riding his bicycle (purchased at an auction for $2) everywhere, including a daily commute to the lab in which he passed by City Hall and rode through the beautiful Tivoli Gardens. One of the things Elio and his colleagues used to do when he was at Tufts University was have their lab meetings outside under the trees. It was great to be surrounded by trees, plants and birds, but the pigeons could be a little distracting. Follow your passions, and never let go of them. Moselio (called Elio by those who know him) is a spry octogenarian who spent his career studying growth physiology and cell structure of enteric bacteria. Born in Italy, he lived in Ecuador before going to the United States in 1950. He served in the U.S. Army at Walter Reed Army Institute of Research, studying the biology of rickettsiae. He then became a postdoctoral fellow for two years in Copenhagen’s laboratory of Ole Maaløe, working on bacterial growth rate regulation of biosynthetic activities. For 23 years (which he describes as “an obscenely long time”), he chaired the Department of Molecular Biology and Microbiology at Boston’s Tufts University, where he became a Distinguished Professor, emeritus. He has served as President of the American Society for Microbiology and the American Association of Microbiology and Immunology Chairpersons. In 1995 Elio retired to San Diego, where he has devoted himself to sharing the excitement of the microbial world, mainly via a blog called Small Things Considered and a podcast, This Week in Microbiology. With others, he has authored ten influential textbooks and reference works, including as editor-in-chief of the Encyclopedia of Microbiology. 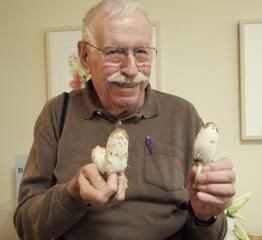 He also authored the book In The Company of Mushrooms which deals with his avocation, wild mushrooms. Currently, he is Adjunct Professor at San Diego State University and the University of California, San Diego.